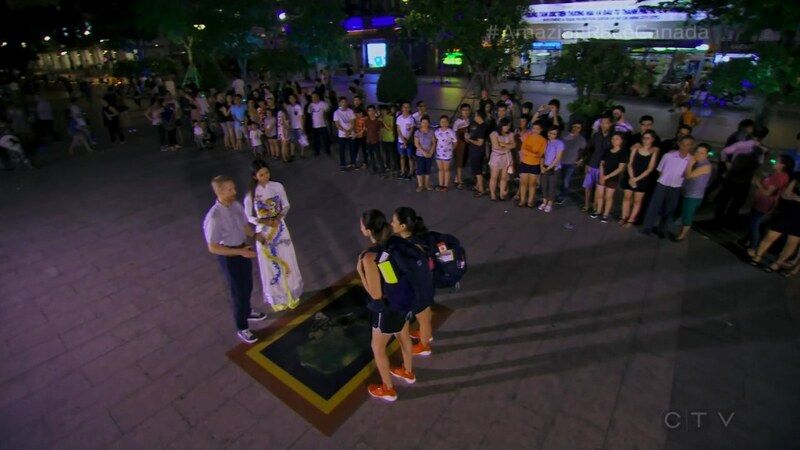 Recap: The Amazing Race Canada 4, Episode 4 – "It's hotter than a hoochie coochie." Teams must now board public bus #3 back to Ho Chi Minh City armed with 1.5 million Vietnamese Dong on their BMO Cashback MasterCard. Once there, teams must find the Ba Thien Hau Temple for their next clue. That clue tells teams to release birds in a traditional good luck ritual to receive the next clue. This clue points teams to the corner of Ly Chinh Thang and Nguyen Thong where they will find the Road Block: Who feels like a tool? For this Road Block, teams must assemble a scooter. Kristen, Joel, Kelly and Emmett decide to do it. Since he’s a mechanic, this task is no problem for Joel who quickly finishes. He and Ashley must now head to Quan A Soi restaurant in District 1 and enjoy a plate of local delicacies; crickets, centipedes, worms and a bat. 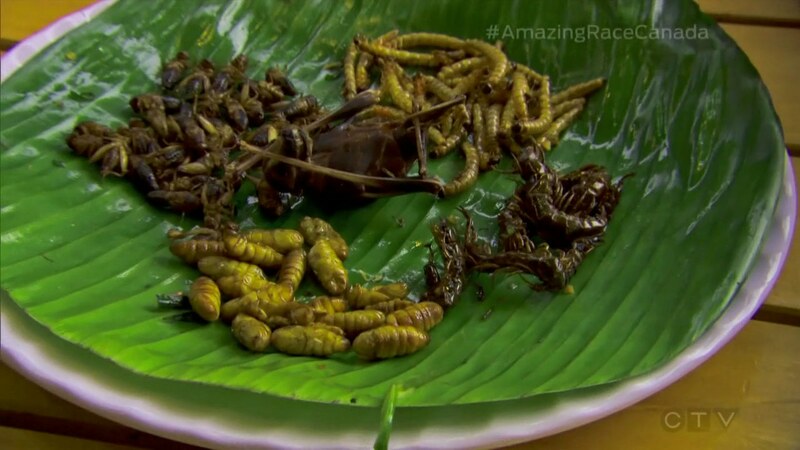 After they’ve eaten the plate, they will receive dessert in the form of two coconut worms, one for each team member. Kristen and Emmett are the next ones to finish the Road Block. Yvette, Frankie and Julie arrive and get started while Kelly finally finishes. Joel & Ashley arrive at the restaurant and fight to swallow the bugs. They receive the next clue revealing the Detour: Flip Flop or V-Pop. In V-Pop, teams must head to Kingdom Karaoke where they must learn and memorize a popular Vietnamese pop song “Shine Your Light” using provided phonetic spellings which they will then perform. Joel & Ashley and Steph & Kristen choose Flip Flop. Jillian & Emmett choose V-Pop. Kelly & Kate have no problem eating the delicious delicacies and decide on V-Pop as well. Steph & Kristen quickly go for their first attempt at the bartending, but they fail. Jillian & Emmett also get the thumbs down from the karaoke-goers as Kelly & Kate arrive. Kelly & Kate decide to translate the pronunciations to Chinese characters which makes it easier for them. Emmett tells Jillian that he can’t do this, so they decide to switch. Kelly & Kate head into the room to give it a try and they get it on their first attempt! They can now head to the Ho Chi Minh City Hall to find Jon and the Pit Stop. They run to the Mat and officially check-in as Team #1! They win a trip to Los Angeles. Steph & Kristen are on their 25th attempt and finally pass. They head to the Pit Stop and check-in as Team #2. Jon cheerily asks them who they’re going to give the Express Pass to and they answer Frankie & Amy. Back at the karaoke, Rita & Yvette pass on their 2nd attempt and step on the Mat as Team #3. Frankie & Amy also get the thumbs up on their 2nd attempt. At the bar, Joel & Ashley finally pass on their 59th attempt and also head to the Pit Stop. Anne & Tanya, who have been in last place and far behind all day are able to catch up to Jill & Emmett at the Skybar. On the other side of the Detour, Julie & Lowell have lots of fun easily getting the thumbs up with their song. At the Mat, Frankie & Amy and Joel & Ashley step on the Mat as Teams #4 and #5. Jon calls Steph & Kristen over so they can hand Frankie & Amy the Express Pass. Julie & Lowell take 6th place. It’s a battle for last place. And on their 63rd attempt, Jillian & Emmett finally pass. Anne & Tanya get it on their 30th attempt. But Jillian & Emmett step on the Mat as Team #7. That means Anne & Tanya are last and eliminated. Ooooo! I definitely enjoyed this episode. It might be my favorite episode so far this season. I was a little skeptical going into it because the idea of a nightlife Detour felt too generic for Vietnam especially since TAR Canada could easily stage this Detour in a Canadian location too. I hoped for a more Vietnam-centric task. But that concern immediately went away as the episode played out. The Leg was certainly very linear, as evidenced by teams again disappearing for chunks of the episode. But the Detour was able to provide just enough competition and fun to really carry the episode. The contrasting Detours and the apparent imbalance of the tasks actually worked to provide that extra bit of drama needed to keep the episode exciting. And that partly made me hope for a Non-Elimination. I don’t know if devoting half of the episode to just the Detour was the best move, but it was interesting to see teams easily completing one side while others struggled for hours on the other side. Maybe I’m just excited Kelly & Kate won the Leg. lol I was getting so tense at the Pit Stop. I was sure Steph & Kristen were going to Racebot their way past Kelly & Kate, but thankfully that faux-drama turned out to be just that. The TWO! Active Route Info tasks were fine. Combined, they probably filled 3 minutes total of the episode, but at least it got teams to do something else. The Road Block was also a good fit for Ho Chi Minh, especially paired with the requisite shot of the hectic traffic. Anyway, it wasn’t the best designed Leg, but it was a fun and exciting episode. Yay for Kelly & Kate! I am so happy they won the Leg. It was a great one for them. 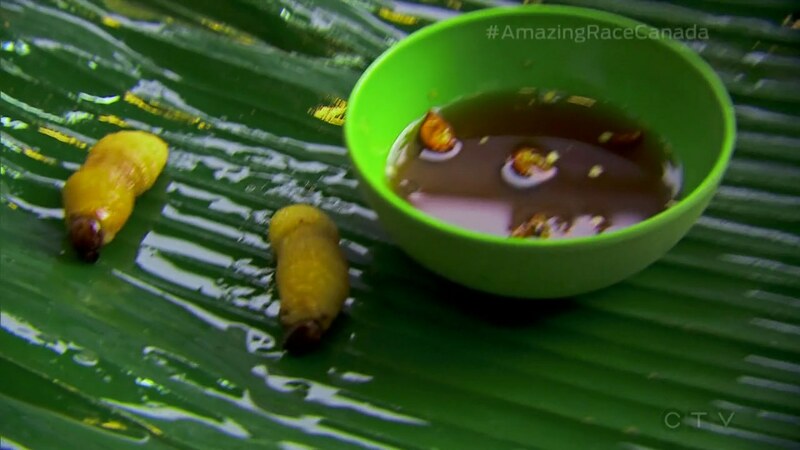 We got to see some funny moments from them like Kate’s fear of feathers and Kelly not being too fast at the Road Block, but we also saw them just speed through the last two tasks of the Leg as well. They are shaping up to be the total package in terms of fun and competent Racers. They can be hilarious, but they can also get the job done. I definitely hope they keep it up moving forward and all the way to the end! Joel & Ashley were doing well until that Detour. But the highlight from them in this episode has to be Ashley’s passive-aggressiveness at the Mat when Steph & Kristen handed the Express Pass over. That was awesomely hilarious. I want to see more fierce Ashley in the future. With the way this Leg was designed, Anne & Tanya had no shot to survive. It was only thanks to Jillian & Emmett sucking so much at the Detour AFTER choosing to switch that it appeared Anne & Tanya could just edge past them and stay safe. But as soon as they arrived at the Road Block after dark when other teams were arriving at the Detour with the sun still up, I think their elimination was a sure thing, unfortunately. They had a great competitive spirit and Raced well most of the time. Of the three eliminated teams so far, Anne & Tanya are the first I’m sad about. Julie & Lowell have been toeing the line between hilarious fun and annoying, but this episode, they were firmly on the hilarious fun side. They really are slipping into the “fun old couple” role on the season and it was especially amusing this week. You can’t help but root for them. And thankfully, their puns and attempted one-liners this week were actually funny! Frankie & Amy were great in the few moments we saw them this Leg. Again, we’re only seeing glimpses of their Racing and entertainment potential. I just hope the show is saving the best for the later Legs when there aren’t many teams left. Meaning, they make it very far, I hope. Rita & Yvette felt almost invisible again this episode. They literally disappeared for half the Leg and it wasn’t until they did well at the Detour and their singing at the Pit Stop that they really made their presence known. Definitely hope to see more from them. Jillian & Emmett had a horrible Leg, mostly because of the Detour. It would’ve been a dangerous Leg for had it not be so linear. They are definitely lucky. I’m kinda sad the Detour struggles didn’t really bring about any good meltdown moments from them. Steph & Kristen are last, but that’s really only because everyone else has had much more to offer. I do hope their lying about the Express Pass brings about some team drama in future Legs. ← Recap: Kamen Rider Ghost, Episode 39 – Opposition! Father and Daughter!